The Government has decided to reinstate the Public Administration Circular 46/90, which was repealed by the Rajapaksa regime, and to recognise Higher National Diploma in Accountancy (HNDA) as equal to a Bachelor of Commerce degree program. Prime Minister Ranil Wickremesinghe turned down opposition allegations of charging the demonstration of unarmed university students, alleging that political forces behind the scene created a tense situation by motivating students who shouldn’t have resorted to a protest march, having got to know the Government decision. “I thank the Leader of the Opposition Rajavarothiam Sampanthan for taking this matter up in the House regardless of its nature and the place in the Southern part of the island. I am sure that he will continue to bring up public issues taking place in all parts of the island even in the future. In the backdrop of the Government having decided to reinstate the 46/90 circular, some political groups fuelled the issue, which led to this. But why don’t the opposition talk about Rathupaswala anymore? It is highly visible that a few opposition members are trying to capitalize on a dead body. However, I will take personal responsibility to table the report of the commission appointed to investigate the attack on HNDA students in this House,” PM Wickremesinghe said, expressing his willingness to meet student representatives if they are eager to discuss the matters through meeting lawmakers inside the Parliament premises. 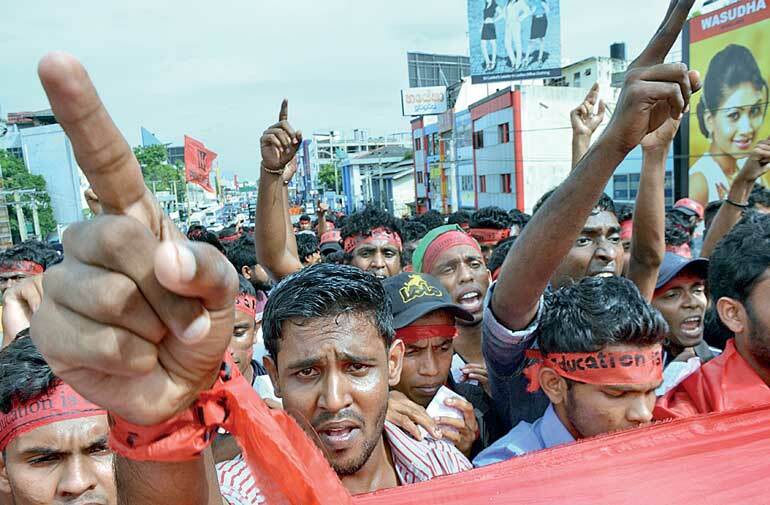 Joining the heated debate, opposition lawmaker Dinesh Gunawardena accused Speaker Karu Jayasuruya for ordering the military and police forces to gather in front of the Parliament entrance to stop the students marching inside the complex. “The previous Speaker made entry to this House easy and free. We saw police and forces gathered at the access way to this Parliament. Who warranted this? Why prevent student leaders from meeting political leaders. You as the Speaker should be held responsible for this,” charged MP Gunawardena.